The disruptions of the blockchain are ready to transform the rules of our society. The technology threatens the most powerful institutions of our generation – the Governments and the Banks. The most powerful impact of the blockchain is the distribution of power from the centralized organizations (which are corrupt, manipulative, greedy and suppressing at times) towards the decentralized and distributed society (thus giving power in the hands of the common man and eliminating the trusted third party). All the merits of the blockchain and its applications have driven the world towards it, and the organizations are adopting blockchain at a steady rate. According to the statistics of Stanford Centre for Social Innovation and non-profit foundation RippleWorks, which analyzed 193 social impact organizations that are using blockchain, the surge for blockchain adoption increased from 2013. The financial inclusion initiatives were the second biggest use-case of the blockchain in 2013. The tamper-proof technology of blockchain has the potential to drive down transaction costs and timelines, while increasing transparency, speed and security. All these qualities have driven institutions to examine various use-cases of the blockchain. Now let us see how blockchain can tackle real-life problems and give us the best financial support. 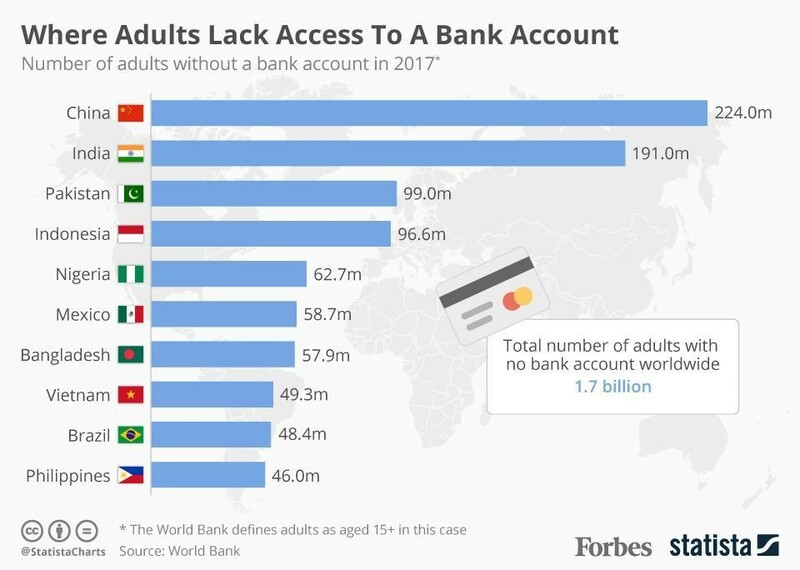 According to the data released by the World Bank about 1.7billion people still don’t have access to Banking services. Most of these people reside in countries which are politically unstable and widespread corruption has curbed the desire for large institutions to enter the market. The financial grant levied to the country for economic development is gobbled by the corrupt governments; this restricts the ability of people to develop economically. The idea of creating a blockchain-based access point for these unbanked populations would be much easier and efficient than attempting to extend the current cumbersome banking system into these troubled regions. Our world economy is dominated by the dollar-focused central banking system, which makes it very difficult for countries with less influential fiat currency to become important players in the world economy. The current financial system is not beneficial for small businesses and individuals offering services and products internationally, as during conversion of currency the company loses significant buying power if their currency is not of equal value to the other parties involved. The blockchain can act as a savior in this case as the decentralized economy would not be owned by any country neither it is affiliated with any organization or region. All this make blockchain platforms as a favorable financial ecosystem. The analysis of the World Federation of Exchanges database, the total value of stocks traded globally is around USD 77.5 Trillion, and the market is evolving day by day becoming more complex and mammoth. The blockchain makes trading in the stock market more democratic with reduced transaction time & operational costs, allowing immediate settlements and automate compliance through smart contracts, with greater levels of security and transparency. Many financial stock exchanges are exploring the potential of blockchain to rejuvenate their stock markets, for instances – the Tokyo Stock Exchange, London Stock Exchange, South Korea Stock Exchange and the National Stock Exchange of India etc. The blockchain is a peer-to-peer technology, and it gives businesses a more efficient solution than the current lackluster systems in place. The technology empowers them to establish themselves in the global market, irrespective of their location. The asset management industry is growing rapidly; it is expected that it would enlarge to USD 145.4 Trillion by 2025. The current system is quite cumbersome and time-consuming as the industry uses a lot of intermediaries. The distributed ledger technology enables direct trading and settlements across boundaries, which in turn can reduce costs, increase data accuracy and reduce delays. 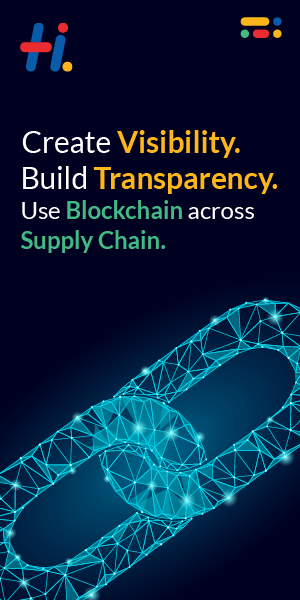 The applications of blockchain technology haven’t been limited to this; rather a several other sectors like the management of supply chain and insurances have been simplified by the blockchain. The blockchain is an inevitable choice to solve the world’s current financial system woes as it enables equal access on the global scale, a corruption-free platform for trade and the regulation on institutions like government and banks exercising excessive power on our society.